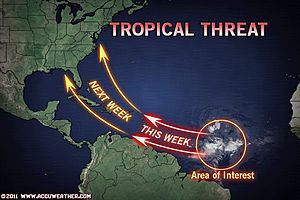 U.S. based weather forecaster Accuweather, has published an article suggesting that tropical waves currently in the mid Atlantic could become organised and intensify into a hurricane which may threaten the U.S. coastline later next week. specifically they are referring to area of investigation 97L which you can on the tracking map on our 2011 Atlantic Hurricane Season page. Accuweather says that if the tropical wave can overcome the obstacles in its path, namely the Antilles and Caribbean islands between it and the U.S., it has a good chance of developing into a hurricane and threatening the U.S. It’s about one week away from the U.S., but it’s direction is uncertain and how it interacts with the landmasses of the islands on its way will very much dictate its potential to strengthen. The tropical wave could also be hindered by a large area of African dust and stable air which it needs to escape to have a full chance of development. It’s certainly worth keeping an eye on the Atlantic over the next week as conditions are becoming much more conducive to storm development.